Sunnyvale, Calif.—February 11, 2013—Vitria Technology, Inc., The Operational Intelligence Company, today announced that the company will be demonstrating its Operational Intelligence Platform at the TDWI Business Intelligence Executive Summit at Caesars Palace in Las Vegas, Nev., from February 18-20, 2013. Operational Intelligence performs real-time analysis on multiple sources of data, including Big Data. 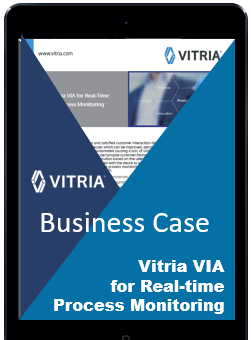 Vitria Operational Intelligence provides real-time, continuous insight into Big Data (in motion and at rest), complex events and business processes to accelerate intelligent business decisions and actions—addressing a variety of use cases ranging from mobile customer monitoring to smart grid analytics. Using Hadoop as a Big Data source, Vitria will provide a first-hand look at its Operational Intelligence Platform, which will include a live demonstration during the evening expo and reception on Monday night. The day after, Dr. Dale Skeen, CTO and co-founder, Vitria, will participate on a panel led by TDWI Research Director, Philip Russom. The panel will focus on aligning technologies with emerging business requirements to create an effective, cost-sensitive and sustainable enterprise data strategy. To schedule a briefing with Vitria executives while at TDWI, please e-mail vitria@schwartzmsl.com.